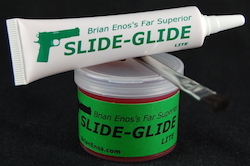 Home / Shop / Slide-Glide Gun Lube / Slide-Glide Gun Lube, Lite,Tub, 2 oz. Please review the Product Description below for applications specific to this viscosity. 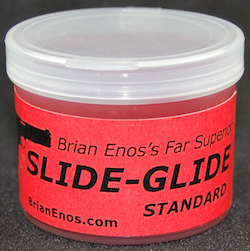 And Slide-Glide isn’t just for firearms. It has many, many uses… Such as hinges, latches, and bearings of all types. 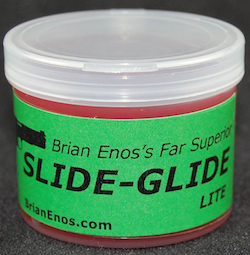 If friction is involved, put some Slide-Glide on it. Be creative. It softens felt recoil in semi-autos. It is blended with the highest-grade extreme pressure compound available. 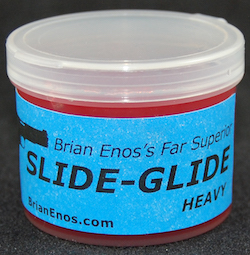 Click for the motherload of Slide-Glide info. Slide-Glide Gun Lube, Heavy, Tub, 2 oz. Slide-Glide Gun Lube, Standard, Tub, 2 oz.